I love fall. Autumn is my favorite season by far. At the beginning, it's still warm enough to wear a light sweater and those cute flats that aren't practical enough for winters up North. The middle and end of fall is when you can break out your riding boots and corduroys, maybe even your adorable coat without having it buttoned up to your neck. Then the weather suffers a drastic change around mid-November, a not-so-graceful transition into the longest season of the year (at least where I come from and where I'm currently living). Don't get me wrong, chunky sweaters and lots of layers are cute for a while. Snow is pretty from Christmastime to a little past new years. I don't particularly like snow when it's my Spring Break and I get snowed in at my house. I don't like that I still have to wear 4 layers to just grab lunch with some friends. I don't need to be weary fuzzy socks anymore! It's easy to say that I am so over winter and cannot wait to jump head first into Spring. 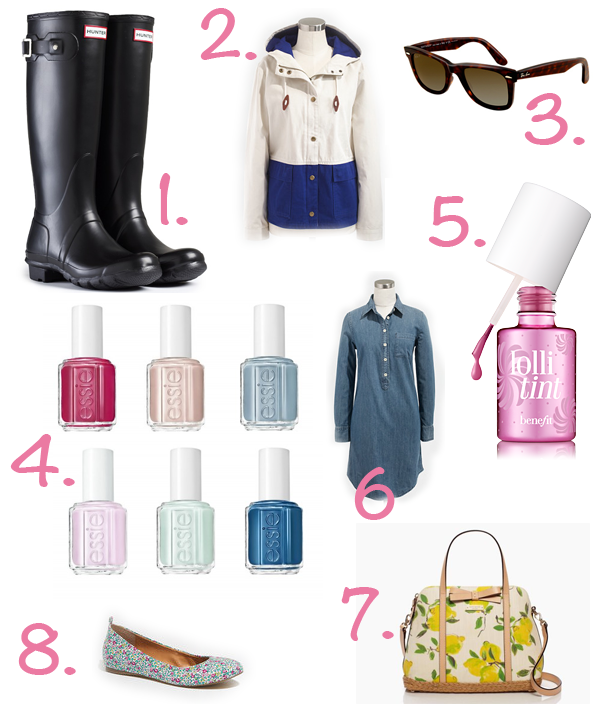 These are some of the items that I'm most looking forward to in Spring.